Cardio training helps to lose weight evenly, but the decrease in volume over the body for a couple of centimeters, even thought elevates the mood, but does not solve all the problems with the figure. Standing in front of the mirror, you are discontent;y thinking your hips and pelvis are still too big in comparison with the narrow shoulders, or, on the contrary, you have narrow hips and broad shoulders. To deal with such deficiencies shapes using cardio and aerobic exercises is useless. Your ally in the fight for an ideal figure is a strength training. For such cases, I recommend downloading the book “Bedrock Strength“. What is a strength training? Power type of training, or as it is also called, anaerobic, aims to develop and strengthen muscle mass and elaborate individual muscle groups. Strength training helps “building” the missing volume in some places and lose weight in other, due to which the body shape correction is happening. The ideal type of female figure is an hourglass when the upper and lower body are equally developed, and there’s a thin waist. Only few are born with such forms, while the rest need the training to get closer to the ideal forms. 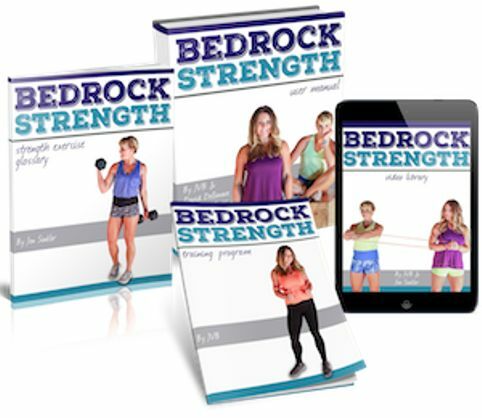 For more information, read the e-book “Bedrock Strength” by JVB. The most effective weight loss technique with long-last result is possible only with proper combination of aerobic and strength training. Despite all the benefits of strength training, cardio should not be forgotten. Cardio helps burning fat(both subcutaneous and visceral fat – around the waist), improves the condition of the respiratory and cardiovascular systems, develops endurance. Before weight training, consult with a physician. This type of training is contraindicated for people with serious disorders of the cardiovascular system, joints and injuries and those who have never played sports. After strength training the metabolic rate increases , which means you lose weight by burning fat.